Since time immemorial when humans began to take possession of the lands and all the things that dwells on it, Muslims and Christians have never been known to cohabit naturally, wherein such is seen to be the case, a closer look will unveil it as the handiwork of the British. We all know that a nation is an entity that naturally evolves by an act of God and not of man, but because of the wickedness of man which can be vividly seen in Britain's creation of contraptions in some West African countries, so many religious crisis has erupted; a case study of Nigeria. Yet they chose to turn blind eye to the constant subjugation of Christians whose interest ought to be of topmost priority to them, considering the fact that the British brought Christianity to the region. Sadly, the United Nations which is an international body saddled with the responsibility of ensuring that peace and order is maintained among nations that are faced with brutal extinction through religious war and agitation for self determination on the cause of their merging incompatibilities, have overlooked the crisis rocking these African countries, an example is the Biafra agitation and Southern Cameroun question. The killing of Biafrans seeking their rightful independence from Nigeria is reverberating at its peak, and the zeal to leave Nigeria is not based on the fact that we cannot live with strangers, but because these strangers are savages and will never cease to kill us unless we chase them away from our lands and live by ourselves. Read also:Biafra: Britain Handed Over Biafra To Hausa-Fulani, But IPOB Is Here To Take It Back! The constant attacks on Biafrans both politically, economically and physically is a clear indication that different ethnic groups in the country were never and can never be one no matter how much we all pretend. Buhari should understand that killing defenseless people is a serious crime against humanity and is also a crime against recognized local and international laws; therefore, coercing Biafrans to live in one Nigeria through brutal force will never make the contraption united. Our mothers are been raped to death, our youths and fathers are been killed for no just cause other than exercising their right to self-determination; but time shall come when we will take the law into our hands and recover what is rightfully ours and until then we will continue to seek our freedom peacefully until every peaceful Avenue is exhausted. BIAFRANS CAME IN THE NAME OF THE LORD GOD OF ISRAEL AND THE ENEMIES OF GOD IN THE BRITISH CONTRAPTION CALLED NIGERIA SHALL BE CONFUSED,CURSED AND DESTROYED ONLY BY THE POWER OF THE MOST HIGH GOD---HASHEM. 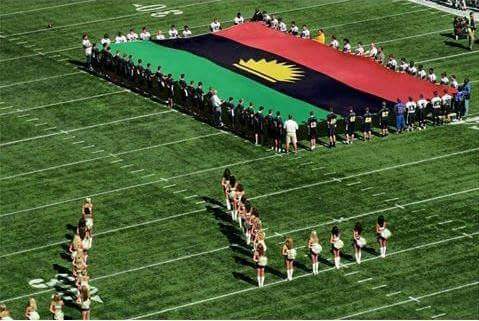 THE BIAFRANS HAVE COME IN PEACE BUT YORUBA/HAUSA/FULANI AND ALL THE EVIL TRIBES SHALL BE UPROOTED AS THE AGENTS OF GOD'S ANGER CALLED BOKOHARAM AND LIKES WILL BE THE PORTION OF ALL THE GOD'S/BIAFRANS ENEMIES.WE SHALL BE IN THE HOUSE OF THE LORD--ISRAEL RISING AND ALL ENEMIES OF GOD BE CONFOUNDED.BIAFRA LIVES!! URS THE BIAFRAN RABBI.